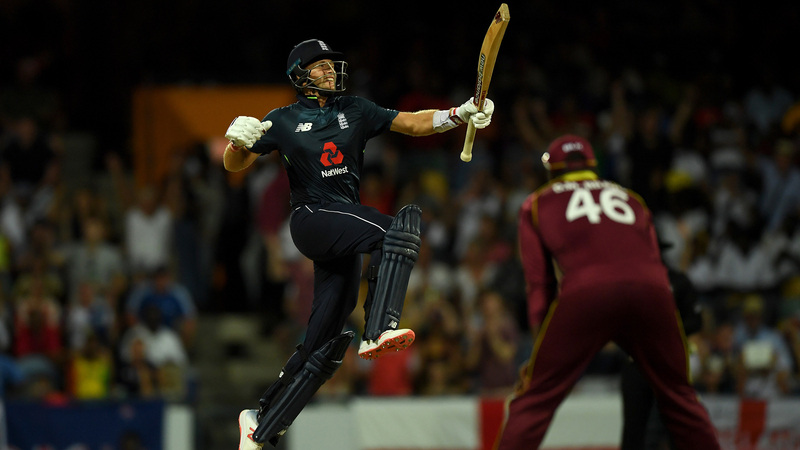 England captain Eoin Morgan praised Joe Root and Jason Roy after his side's record-breaking one-day international win over West Indies in Barbados. Roy (123) and Root (102) scored centuries as England reached their target of 361 with eight balls remaining to seal a six-wicket victory in the first ODI. It was the nation's biggest successful run chase in ODIs, topping the 350 they managed against New Zealand in June 2015. Morgan praised Root and Roy for their 114-run partnership, but rued the way England fielded in the series opener. "Joe and Roy, when they bat together, complement each other. The way they batted proves that," he said, via the ICC. "We just didn't have a great day in the field, and we need to hold our catches on this kind of ground and wicket. "Adil [Rashid] bowled well when he was asked. We are happy with where we are, and that's good with the World Cup in perspective." Our highest ever winning chase in an ODI!! Chris Gayle (135) put the Windies in a good position as the hosts smashed a record 23 sixes during their innings. But captain Jason Holder lamented the chances his team missed, with Roy and Root both dropped twice, the latter firstly when he was on 46. "We didn't bowl as well as we'd like, and we simply didn't do well in the field," he said. "Our energy and body language wasn't up to the mark, perhaps due to missed chances. "The bowlers did create chances, but we didn't hold them – almost 6-7 chances. If we hold onto those... we will definitely be better in the next game." The second game of the five-match series is on Friday.